The canal was contaminated between the 1950s and late 1980s as a result of stormwater discharges from a former sawmill, which treated timber using Pentachlorophenol (PCP). While unknown at the time, PCP imported into New Zealand for use in the timber processing industry also included a percentage of impurities that contained dioxins. Find out more about the clean-up of the Canal, key documents, reports and updates below. The Kopeopeo Canal extends from the Rangitāiki Plains to the west of State Highway 30. It runs east where it joins the Orini Stream and then discharges into the Whakatāne River. It was built in during the 1920s to convey drainage and floodwaters from low-lying farmlands in the Rangitāiki Plains into the Whakatāne Estuary. 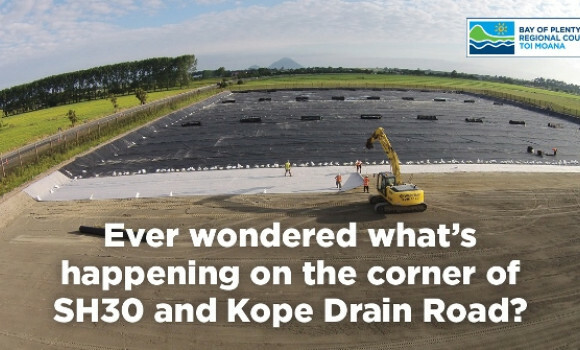 As owner of the Kopeopeo Canal, Bay of Plenty Regional Council’s Technical Services Group has a statutory and regulatory responsibility to manage contaminated land and protect the community and the environment. The project is designed to be implemented in a staged approach to remove, safely store and bioremediate up to 40,000m3 of sediment. Three separate sites are consented for the containment and bioremediation of sediment removed from the canal. View a map showing sites. The estimated cost of the project is $15.5 million and is equally funded by the Ministry for the Environment through the Contaminated Sites Remediation Fund (CSRF) and Bay of Plenty Regional Council. 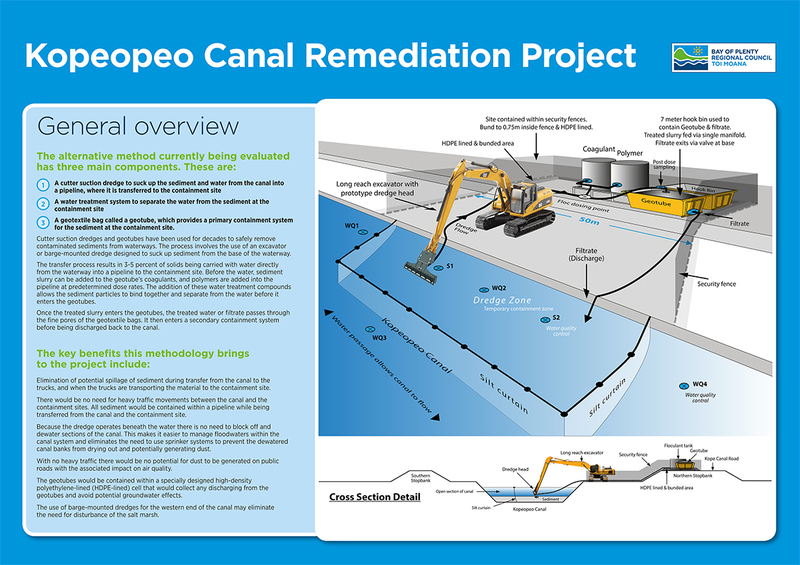 Read about the background of the Kopeopeo Canal Remediation Project and view core documentation related to the project. Monthly report by the Independent Monitor for the Community Liaison Group. Dec 2017 Monthly report by the Independent Monitor for the Community Liaison Group. Sept 2017 Monthly report by the Independent Monitor for the Community Liaison Group. May 2017 Monthly report by the Independent Monitor for the Community Liaison Group. Independent Monitor review of a series of documents related to myco and phytoremediation studies of Kopeopeo sediments. The dashboard provides a brief update across a range of activities including progress on dredging and validation, expenditure, complaints and compliance. Please note the large size of some of the following files. If you are unable to access these files, please contact us. Memorandum prepared by Stephen Park, Senior Environmental Scientist (BOPRC) reporting the results of an investigation into contamination of both sediment and eels. Further air quality monitoring before works start. Further baseline ambient air monitoring including a new site on Kope Canal Road (adjacent to the wastewater treatment ponds) between October 2015 and January 2016. This report documents baseline data (the existing levels of dust and dioxin in air prior to commencement of the works) so that any changes resulting from the project can be assessed. The trial was carried out in 2015 to test a different methodology for removing sediment from the Canal. This methodology uses a cutter suction dredge to remove sediment through a pipe to the containment sites. This is now the consented methodology. The trial allowed the Project Team an opportunity to address some key concerns from members of the community including noise, groundwater contamination, traffic and dust, flooding and drainage. A number of reports were prepared to consider the impact of the changed methodology on some of these factors. These reports provide useful background on the consented methodology. This assessment considers and compares the traffic impacts associated with the current and alternative methodology. This report considers the potential groundwater effects associated with the current and alternative methodology (as trialled in Sept/Oct 2015). This report considers the differences in managing potential flood and drainage related effects. It includes a draft Flood Management Plan which documents one way to manage potential effects associated with the proposed methodology. The final flood and storm water management plan has been developed in consultation with the physical works contractor and approved by the Consent Authority. This is a noise assessment in relation to the proposed cutter suction dredge methodology. On completion of the Trial, several reports were completed including the results of the Trial and compliance with consent conditions. This technical assessment reviews the consented and proposed methodologies with specific regard to discharging filtrate back onto the Kopeopeo Canal and not to groundwater. This document is in two parts due to the size of the files. This report outlines compliance with consent conditions for the trial of the alternative Canal dredging method (resource consent 68275). The executive summary is on page 5 (Part 1). This report documents the monitoring, sampling, and laboratory analysis from the dredging and sediment dewatering trial that was carried out during September/October 2015. This is a factual report with laboratory and field data collected during and after the trial. This is a report from EnviroWaste that focuses on the dredge methodology including the amount of water and sediment moved through the system, turbidity levels, use of the geotubes, discharge rates, health and safety, consent compliance and the public open days. The Community Liaison Group (CLG) was formed in 2015 to provide two-way information sharing about the project between the Consent Holder and the community. It meets regularly and agendas and minutes from meetings held in the last 12 months are at the bottom of this page. For earlier meeting materials, please email us. The next Community Liaison Group meeting will take place on Wednesday 15 May 2019. Please email kopeopeo@boprc.govt.nz to register your interest in attending. The CLG is a forward-looking group that seeks the best outcomes for the project and the community by ensuring the free-flow of information, transparency and practical advice to the project. Helping to ensure that the community is well-informed with accurate and timely information about the project, including progress, monitoring results and any issues. Providing community feedback to the project team so the project can respond to any concerns. This will be done by establishing a database and managing the information and actions required of the project team members, and through the approval of the communications plan. Appointing a member of the CLG to the selection panel for the independent monitor. Appointing a member of the CLG to the project steering group. The CLG was formed through a process of invitation to submitters and stakeholders identified in the consent conditions. Attendees were invited from the area around Containment Site 1 (CS1), CS2 and CS3, the Department of Conservation, Toi Te Ora Public Health, WDC, Whakatāne Harbour Care Group, Fish and Game, NZTA, Te Rūnanga o Ngāti Awa, SWAP, Federated Farmers, Whakatāne Waimana Rivers Scheme Liaison Group, Hokowhitu Marae and Andrew Kohlrusch, the Independent Monitor. You can view full terms of reference. All meetings are open to the public. Please contact us if you would like to address the meeting in the public section so that time can be set aside in the agenda. The next Community Liaison Group meeting will take place in early 2019 - date to be confirmed. Please email kopeopeo@boprc.govt.nz to register your interest in attending. Led by the late Joe Harawira, Sawmill Workers Against Poisons (SWAP) and Ngāti Awa sought solutions to clean up dioxin-impacted sites, restore mauri and bring attention to the human health issues contamination has caused. As kaitiaki, SWAP and Ngāti Awa needed to find ways for people to help Papatūānuku heal herself and restore mauri. The story of The Green Chain, a three-part documentary, tells of the impact on the canal and the community of the contamination from the stormwater discharges from the former sawmill. It follows former Whakatāne sawmill worker Joe Harawira and his long battle to reveal the impact that workplace toxins have had on his community. SWAP inspired Te Ohu Mō Papatūānuku, a collaborative project that tested whether natural resources such as plants and fungi can decontaminate sites, soils and sediments through bioremediation. 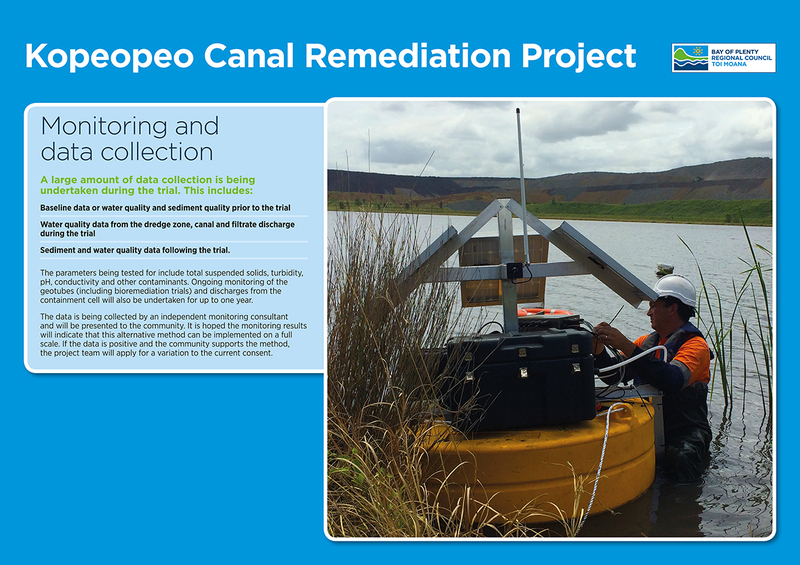 Kopeopeo Bioremediation Trials Project: Te Ohu Mō Papatūānuku was completed in 2011 and demonstrated the ability of bioremediation to degrade dioxin in sediment from the Kopeopeo Canal in small-scale trials. The results of recent investigations show some sediment was excavated from the canal from the 1950s-1980s and has resulted in dioxin-impacted soil being placed on stopbanks on the southern side of the canal. This land is subject to a separate investigation and is not part of the sediment remediation project. The area has restricted access and is considered to be low risk. However a review of long-term management or remediation options will be prepared and discussed with the community in the future. Understandably, there are strong feelings in the community about the state of the canal. In May 2013, Campbell Live reported on some residents’ concerns regarding the project and a petition was made to the Local Government and Environment Committee. The final report on the petition is available here. The project team is working closely with the community and has resource consent to use a staged approach to remove, safely store and clean up the contaminated sediment using bioremediation. The selected bioremediation method breaks down contaminants using a combination of fungi, bacteria and plants to degrade dioxin. The applicant submitted a resource consent application in March 2013, which was publicly notified on 10 April 2013. Submissions on the resource consent application closed in May 2013. A public hearing was held and, in February 2014, the independent commissioners advised that the application for resource consent had been successful, subject to significant conditions. That decision was appealed to the Environment Court on 11 March 2014. In November 2014 the appeal was resolved by way of court order. Many submissions on the consent indicated the community was concerned about various elements of the project, particularly traffic, dust and spillage during removal and transportation. A trial of a new methodology (watch video) was carried out in 2015. On the basis of the trial results and positive community feedback, a variation to the existing consents was applied for. A variation was granted to the original consents to reflect these changes in methodology in September 2016. Kopeopeo Canal Notification Decision - allowing variation to the consent to be non-notified. Independent Commissioner Decision - granting of consent variation. Find results of samples collected along the Canal. What contaminants are present in the Kopeopeo Canal? Testing for other contaminants, including timber treatment chemicals, has not revealed any other elevated contaminants of concern. How did the contamination get there? Between 1950 and 1989 surface run-off and storm water from the NZ Forest Products Ltd Sawmill was discharged into the canal. The discharge contained wastes from the sawmill, where technical-grade Pentachlorophenol or PCP was used as a wood preservative. It wasn’t known at the time, but the PCP imported into New Zealand contained impurities (dioxins).When the potential health risks were identified the timber industry voluntarily withdrew PCP from use in New Zealand. Dioxins refer to a particular group of chemicals that can harm human health under certain conditions. The likelihood of risk to human health increases as the concentration and exposure duration increases. Dioxins are part of a wider group of contaminants called persistent organic pollutants. They break down very slowly (decades) and remain in the environment for a long time. More information can be found on the Ministry for the Environment website or the Ministry of Health website. Dioxins are an unwanted by-product from the production of other chemicals, in this case PCP, which was used historically as a wood preservative. Other sources include discharges from smelting and chlorine bleaching of paper pulp. There are also naturally occurring sources of dioxins such as volcanic eruptions and forest fires. Further information can be found on the World Health Organisation website. Are the dioxin levels in the Kopeopeo Canal a risk? Investigations dating back to 2005 have concluded that dioxin levels in the sediment are elevated and have resulted in eel tissue concentrations of dioxin posing a risk to human health if consumed. A human health risk assessment concluded that a 5.1km section of the canal had sediment that required remediation to ensure the risks to human health could be eliminated. Until the canal is remediated, health advisory warnings have been put up along the canal to discourage people from catching and consuming eels from the Canal. While concentrations of dioxins in the canal sediment are also above the National Environmental Standards for the Assessment and Management of Land to protect human health, direct exposure to the sediment is limited due to its location in the canal. The sediment has now built up so it is affecting the canal's ability to convey floodwater. Removal of the sediment is also necessary to ensure an extreme flood event would not result in the canal water overtopping the flood banks and flowing on to surrounding land. Is dioxin still flowing into the stream? No. PCP and its contaminant dioxin has not been used for timber treatment for decades. The old sawmill site was closed and decommissioned in the mid-1980s. The site is mostly vacant land now and stormwater generated on it no longer contains dioxins. Is it just sediment in the canal that shows unacceptably high levels of dioxin? No. Results from several investigations between December 2014 and February 2015 showed there are elevated concentrations of dioxins in surface soils on stop banks located on Bay of Plenty Regional Council land around the Kopeopeo Canal, near the former mill discharge area into the Canal. This surface soil contamination is likely to be associated with previous dredging activities carried out by the former drainage board. This area is currently outside of the scope of the Kopeopeo Canal remediation project. The area has been fenced off and signs put up to warn anyone accessing this private land. The risks to human health associated with the dioxin impacted stop banks is considered to be minor due to the current limited use of the land. In the longer term, trials are proposed to assess the effectiveness of using bioremediation (see ‘What is bioremediation?’ section) to breakdown the dioxins in-situ. Is anyone being exposed to the dioxin? While the contaminated sediment remains in the Kopeopeo Canal, the main exposure route is through the food chain. At the bottom of the food chain, filter feeders accumulate dioxin. This accumulation of dioxin increases with every step up the food chain. This means eels may be unsafe to eat. People are advised not to eat eels from the contaminated stretch of the Kopeopeo Canal, as doing so could expose them to human health risks. Historical dredging of the canal has also resulted in dioxin-contaminated spoil being placed on the top of the canal banks. Further investigations to determine the extent of the contamination associated with this historical activity are ongoing. At present the risk to adjoining landowners and the community is minimal because no one regularly accesses the area. The council intends to install better boundary fences along the canal to further minimise public access. In the long-term, options for remediation or management of the stopbank material will be considered. Steps will be taken during this project to reduce the risk to remediation contract staff and the community. We will ensure dioxin is contained within the pipeline when it is being transferred from the canal to the containment sites and undertake regular monitoring to ensure the proposed control measures have been effective. When will the eels will be safe to eat again? We expect this will be 2-5 years after the dioxin-contaminated sediment has been removed from their environment. The eels will be monitored regularly and the data shared with the consent authority and the community. Once sufficient data confirms the eels are safe to eat, health advisory warnings will be lifted. What level of dioxin exposure is considered safe and why? Dioxin laboratory analysis and evaluation of laboratory data is a complex process. There are a large number of different dioxins and furans which each have their own chemical structure and toxicity. To account for this complexity, a system was developed and reviewed by experts in this field prior to being adopted internationally. This system defined a ‘toxicity equivalence factor’ which is applied to each individual dioxin or furan congener (a related chemical substance). The value of each of the congeners is then added together to provide a total dioxin concentration expressed as the International Toxic Equivalency (I-TEQ) or World Health Organisation Toxic Equivalency (WHO-TEQ) derived value. The data presented on our website is based on the I-TEQ values and reported in picograms per gram (pg/g). There are also three levels reported in each result; lower bound, medium bound, and upper bound. We use the more conservative ‘upper bound’ values for the concentrations presented on the website because these assume that a concentration might be present just below the laboratory method of detection, rather than absolute zero. This will result in a value that could be zero, being expressed as 0.00 pg I-TEQ/g for the lower bound, 10.0 pg I-TEQ/g for the medium bound, and 20.0 pg I-TEQ/g for the upper bound. The table below provides a list of Soil Contaminant Standards (SCS) that came into effect in New Zealand in 2012. These values are based around different land uses where a variety of specific exposure pathways and occupant durations are considered. For example a residential land use scenario considers a 30 year- exposure duration, and exposure pathways such as dermal or direct contact, inhalation of dust, consumption of home grown produce, and ingestion. When long term or chronic exposure to levels above the SCS occurs there is an increase in cancer risk to 1 in 100,000 people exposed. 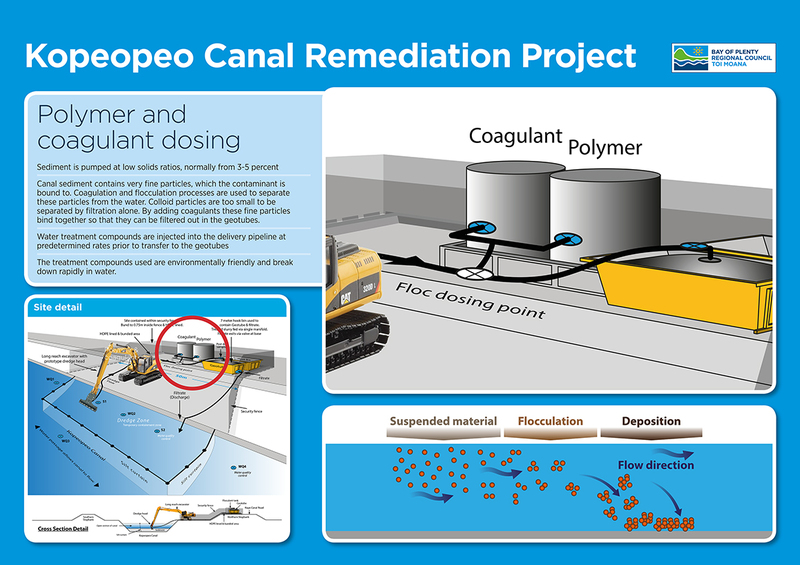 The Kopeopeo Canal remediation target is a site specific human health based target and has been defined to ensure that there is no human health risk associated with direct contact through recreational use, and consumption of eel tissue following the completion of the remediation project. The USEPA drinking water standard is based on the most toxic dioxin congener; Tetrachlorodibenzo-p-dioxin 2,3,7,8- (TCDD) and is therefore expressed in picograms per litre (pg/L). Is there any risk that the sediment might impact on local produce (grass, milk, fish)? If the canal clean-up was not completed, there would be potential for sediment to be inadvertently placed onto adjoining farmland in the future. Dioxins are not readily taken up by plant matter so cows would need to consume the actual contaminated sediment or drink water directly from the canal with re-suspended contaminated sediments in order for them to be consumed and then impact on milk quality. The containment measures implemented during the project will be backed up with monitoring to ensure that dioxins do not escape and enter the food chain. The current methodology was discussed in several workshops with representatives from major milk supply companies prior to implementing the project. Overall these organisations were happy with the revised methodology, monitoring regime and independent oversight being carried out by the Independent Monitor. Fish, particularly eels (tuna) within the canal system have been monitored and are not considered safe to eat. Fish have been removed from the canal and euthanised prior to being disposed of safely. One aim of the remediation works is to be able to prove through long-term monitoring that the fish are safe to eat following the remediation works. Bioremediation enhances the natural degradation process that breaks down contaminants. For the sediment a combination of fungi, bacteria and plants are proposed to help speed up the natural degradation of the dioxins. You can also read more about bioremediation in the presentation to the CLG. Does this bioremediation plan use proven technology? This proposal to bioremediate using a combination of naturally occurring fungi and trees (poplars and natives) is innovative. However we are confident that it will work, following a trial involving a range of organisations and led by Te Rūnanga o Ngāti Awa in conjunction with Bay of Plenty Regional Council. Why was bioremediation chosen as the treatment method? Often remediation of dioxin impacted soil or sediment is undertaken on former industrial sites as part of urban renewal. Land developers commonly fund these clean-ups using thermal desorption units. These units effectively cook the soil/sediment and drive off the dioxins. This treatment method is often favoured because the contaminated site is proposed for redevelopment and there are time constraints in the redevelopment schedule. In comparison to other treatment methods, thermal desorption is fairly costly due to its energy requirements. In the case of the Kopeopeo Canal, the concentrations are much lower than those commonly found on industrial or manufacturing sites and there are no time constraints. In addition, the project is funded by ratepayers and taxpayers, not developers, and this was a consideration in the treatment selection process. Other factors that were considered were the need to remove the sediment from the canal for flood conveyance improvements and the cultural values associated with not leaving the contamination for future generations to deal with, and not taking the contamination outside of the rohe thereby making it someone else’s problem. Overall, the use of bioremediation was considered to have the right balance following the consideration of costs, treatment timeframes, and cultural and community views. How long will the sediment bioremediation treatment take? We have estimated it will take 12 years. Bay of Plenty Regional Council will carry out regular monitoring to assess progress until completion. Regular monitoring will provide an indication of how remediation is progressing and a basis for reporting. Why not use one instead of three sites for bioremediation? Three sites were selected for the original excavation and transport using heavy trucks and trailers so that the cartage distance was shorter and therefore the risk of any spillage occurring was minimised. Potential traffic effects also played a big part in the selection of the containment site locations and three sites were selected to avoid crossing any major roads, such as SH30. Now that the dredging consent variation has been granted, the sediment can be pumped along a pipeline to the containment site, eliminating any traffic-related effects and allowing the consideration of using fewer containment sites. Following further investigations and discussions with landowners, other stakeholders and the community it was decided that the two Council-owned containment sites would be used. Will there be a smell associated with the geobags either open or closed? Is bioremediation a “smelly” process? There may be some minor odour associated with the bioremediation process and changes in chemistry of the canal sediments when they dewater. This should be addressed via the addition of lime during the dredging process which will help stabilise the pH, and also through the use of geobags to contain the sediment. The Consent Holder intends to monitor odour during the process. Why don’t you leave the sediment in place? Won’t most of it have washed into the sea or broken down? Dioxins bind strongly to the sediment and, once bound, do not release to the water. The flat grade of the Kopeopeo Canal means the sediment doesn’t readily move downstream. This, coupled with the slow breakdown of dioxins in this environment, mean the problem will remain unless we do something about it. Dioxins can also accumulate in the food chain which is one of the key drivers for carrying out the remediation project. The sediment has now built up so it is affecting the Canal’s ability to convey floodwater. Removal of the sediment is also necessary to ensure an extreme flood event does not result in the canal water overtopping the flood banks and affecting surrounding land. Why not take the sediment to landfill instead of remediating it? Landfill burial was evaluated along with many other remediation options in 2010, prior to the current consents being applied for and granted. This option was eliminated from further consideration due to costs and potential traffic effects. Due to the type of contaminant, the dewatered sediment would need to go to a landfill at Hampton Downs (North Waikato) or Tirohia (near Te Aroha). The long cartage distances involved increase the risk of spilling as the result of an accident. Cultural beliefs have also been taken into consideration during final selection of the remediation process. Ngāti Awa are strongly opposed to removing material from their rohe and prefer that the process of ‘healing the land’ occurs locally. Is there any urgency to get sediment removed? As well as addressing the contaminant problem, the build-up of sediment in the canal reduces its drainage capacity and is contributing to drainage problems on the plains that flow into the Kopeopeo Canal. Typical drain maintenance - removing sediment to restore drainage capacity - cannot take place as long as contaminated sediments are in place. The Consent Holder (Bay of Plenty Regional Council’s Rivers and Drainage Group) has the necessary funding and consents to undertake the remediation. Significant delays could jeopardise the funding agreements or result in the works not being completed within the consented time period. Removal of the sediment is also necessary to ensure an extreme flood event does not result in the canal water overtopping the flood banks and impacting surrounding land. Why not realign the canal and fill it in? Wouldn’t that be cheaper? This option was also considered. However physical constraints on moving the canal and underground infrastructure (wastewater, fibre optic, power cables) along the canal corridor mean this is not viable and the expense would be prohibitive. Why are you putting the sediment back onto rural land? We have read in the Whakatāne Beacon that this breaches United Nations Environment Programme practices. Is this true and could it impact on our ‘clean/green’ image which is important to international trade? A large number of sites were considered during the early stages of the project. The original method needed to have three sites close to the Canal because sediment was being excavated and transported to the containment sites by road transport. These sites were then negotiated and either purchased or leased prior to getting resource consents for containment of the sediment. While the new method is not reliant on road transport, a decision was made to retain and use two of the three containment sites (CS1 and CS3) for the safe storage of dredged sediment. While one containment site (CS1) is located in a rural setting, the containment measures at the sites have been enhanced to ensure no contaminants will discharge onto adjoining rural land. A stringent monitoring regime is also in place to ensure that the containment systems are working adequately. While the UNEP has developed requirements for the management, treatment and disposal of persistent organic pollutants (POPs) such as dioxins, these requirements only apply to the bulk storage of concentrated wastes that contain concentrations of dioxins above 50 milligrams per kilogram (mg/kg), which is around 10,000 times higher than the concentrations of dioxins identified in the sediments within the canal. For more information, see page 41 of the Environmental Management Tool Kit for Obsolete Particles. Will the treatment sites or the groundwater below them become contaminated? 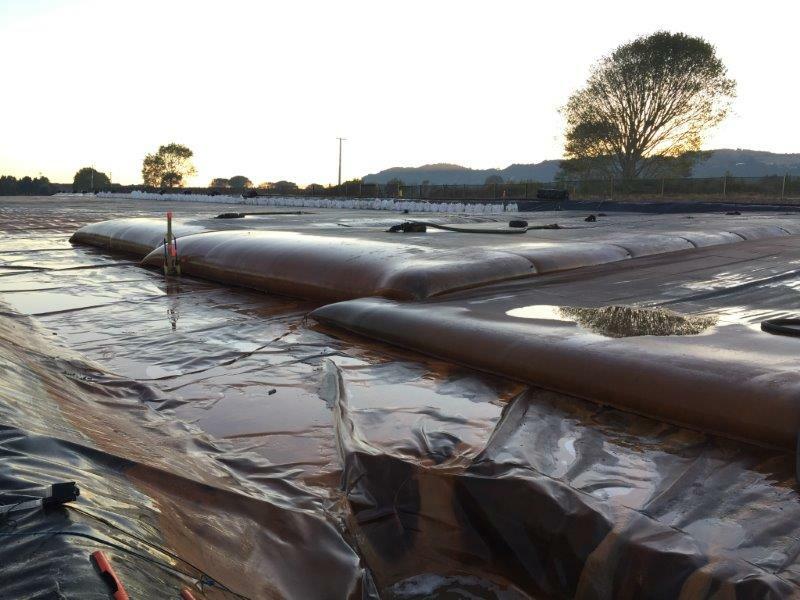 The sediment will be placed into geotubes (geotextile bags) which will be placed within fully enclosed ‘containment cells’. These cells will be formed using high density polyethylene (HDPE) liner which will eliminate sediment-bound contaminants’ movement into the surrounding soil or groundwater. There are extensive monitoring conditions the consent holder needs to comply with, including the monitoring of the containment sites and the groundwater beneath them. The contaminant is hydrophobic and does not result in impacts to groundwater. Results recently obtained from historical dredge spoil placed along a stopbank indicate dioxins at the surface have not migrated through the soil profile, even when exposed to the environment for at least 30 years. Did you trial a new methodology? Many submissions on the consent indicated the community was concerned about various elements of the project. The key concerns were associated with traffic, dust and spillage during removal and transportation of partially dewatered sediment to the containment sites. Additional concerns were raised about potential releases to the environment during the filling and addition of bioremediation components before the containment sites were sealed. Cutter suction dredging and geotube dewatering has been available in many parts of the world for decades but has only become available in New Zealand during recent years. The technique involves removing the sediment using a mechanical cutter head directly adjacent to a suction intake. As the sediment is disturbed, the suction pump draws it up into a pipeline and transfers it to the containment site. At the containment site the water/sediment slurry is dosed with commonly used chemicals, called flocculants, which separate the solids from the water. The separation occurs in the pipeline prior to it being pumped into geotubes. These tubes are designed to allow the water out but keep the sediment in. The discharged water (filtrate) collects in the base of the HDPE-lined containment site before it is tested. It then discharges back into the canal. Further details of this process can be viewed here. On the basis of the trial results and positive community feedback, a variation to the existing consents was applied for. The variation was granted on a non-notified basis by an independent commissioner. What will happen to the sediment after treatment? Sediment will be left in place at the containment sites following treatment. The final land use of each site will be determined by the treatment level achieved and other site specific controls put in place. What will this work mean for the drainage scheme? When the sediment has been removed the water flow in the canal will be increased. This means better land drainage and greater flood protection. What will the containment sites look like at the end of the process? This cross section of the containment sites shows the various components of the containment sites during the long-term remediation process. Will the dioxin escape while it’s being transferred? How will the dioxin be contained and not end up spread in the air? The cutter-suction dredge method eliminates that bulk of the risks associated with potential spillages of contaminated material and dust generation. This is because sediment is transferred from the canal directly to the containment sites via a pipeline. While technical assessments carried out in support of the variation application indicated that there would be little to no risk of air quality effects the consent holder has retained air quality monitoring in the consent to provide piece of mind to surrounding residents and the general community during the works. This is a condition of the consent and there will be ongoing monitoring and reporting of air quality to ensure compliance. How much of the canal will sediment be removed from? Approximately 5km of canal will be remediated between State Highway 30 at Kope Drain Road and the confluence of the Kopeopeo and Orini Canals. This area was defined using sediment and eel tissue sampling and analysis. 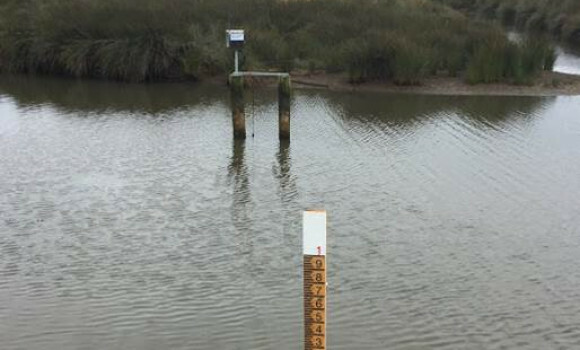 Recent sediment testing to the west of SH30 has shown sediment concentrations at levels above the remediation target. This area is on privately owned land and outside of the scope of the current project. Further discussions with landowners, and sampling and analysis of the sediment, is underway to define the extent of the elevated concentrations in order to determine appropriate management or remediation options. Who will monitor what happens during physical works? The contractor has control measures in place and carries out monitoring in accordance with the consent conditions. The consent authorities undertakes compliance testing and spot checks of their own, and ensures the project remains compliant with the conditions. An Independent Monitor has also been appointed to oversee the works programme and will review and report on compliance monitoring data. Monitoring results will be assessed against predetermined limits designed to ensure health risks are eliminated. This data will be uploaded on to the project website. A Cultural Monitor has also been appointed to oversee the works and manage the recovery of any koiwi or taonga unearthed during the Kopeopeo Canal Remediation Project. The Cultural Monitor will also advise contractors and staff on cultural matters associated with works on the project. Why was the extraction and containment method changed? A geotextile bag called a geotube, to provide a primary sediment containment system at the containment site. The geotubes are located within an high density polyethylene (HDPE) lined cell. Elimination of potential spillage of sediment during transfer from the canal to the trucks, and when the trucks are transporting the sediment to the containment sites. There would be no need for heavy traffic movements between the canal and the containment sites. All sediment would be contained within a pipeline while being transferred from the canal to the containment site. Because the dredge operates beneath the water there would be no need to block off and dewater sections of the canal. This makes it easier to manage floodwaters within the canal system and eliminates the need to use sprinkler systems to prevent the dewatered canal banks from drying out and potentially generating dust. With no heavy traffic there would be no potential for dust to be generated on public roads with the associated impact on air quality. The geotubes would be contained within a specially designed high-density polyethylene-lined (HDPE-lined) cell that would collect any water discharging from the geotubes and avoids potential groundwater effects. The use of barge-mounted dredges for the eastern end of the canal may eliminate the need for significant disturbance of the saltmarsh. The work to transfer the sediment to the containment cells has been awarded to Envirowaste Services Ltd. as a result of a competitive tendering process. A multi-disciplinary team will carry out the bioremediation implementation, led by research organisations and specialists. Conditions are stipulated in contracts to ensure a high level of care is taken throughout the works to ensure safety of workers and the community. Following granting of a variation to the consent, physical works commenced in early 2017 and is ongoing. Who can I contact if I’ve got questions? The Community Liaison Group has been formed to provide a conduit for information transfer between the project and the community. Members of the public are welcome to attend CLG meetings and to raise any concerns they may have in relation to the project. The Independent Monitor has also been appointed to provide independent technical advice in relation to the project. You can use the form below to contact the project team. How can the council be the consent holder and consent authority? As landowner of the canal, the Bay of Plenty Regional Council Rivers and Drainage Group needs to maintain the Canal and is the consent holder. 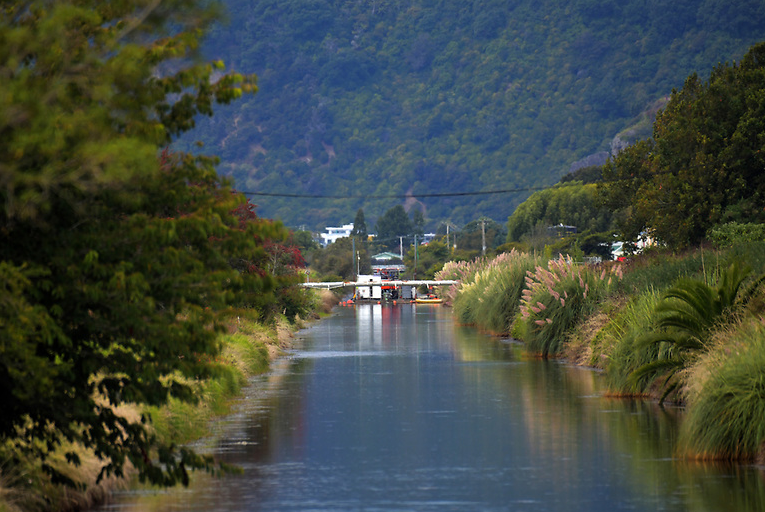 Given the rules under the regional and district plan, consents were required from the Bay of Plenty Regional Council and the Whakatāne District Council to remediate the canal. Bay of Plenty Regional Council is aware of the need to maintain a degree of separation between the consent authority and the applicant, and to avoid even the perception of a conflict of interest. For the Kopeopeo Canal Remediation Project this has been achieved by engaging independent experts for the processing of consents and the peer review of technical reports submitted in support of the application. The decision to allow the variation to the consent was approved by an independent commissioner. In addition, an Independent Monitor (IM) has been appointed to oversee the project and review and comment on compliance-related data that is being collected during the physical works programme. A Community Liaison Group (CLG) has been formed and represents a broad and diverse range of community groups and members. The IM is preparing regular reports for the CLG so its members can get impartial feedback on compliance and progress throughout the project. Any Regional Council regulatory compliance and/or enforcement action will be undertaken by Council officers with no previous involvement with the consent process. They will liaise closely with the IM so any compliance issues are promptly addressed. What can I expect to happen if I raise a complaint? Complaints can be registered using the project’s complaints register or using the contact page to get in touch with the project team. Alternatively, concerns can be logged with the Consent Authority here or by contacting Council’s regulatory compliance group via phone. The regional council’s pollution hotline is 0800 884 883, or you can phone Whakatāne District Council on (07) 306 0500. Once a complaint is lodged it will be investigated by the appropriate council staff and will generally involve discussions with project staff members, contractors and/or the Independent Monitor. The method to close out the issue identified will be recorded and shared with the complainant. A register of complaints will form part of the reporting to the CLG. What happens during physical works if there is a breach of a consent condition? This depends on the level of non-compliance. In every case it is a decision made by the individual council’s regulatory team. In minor cases that are unlikely to impact public health or generate environmental effects, the consent authority may seek ways to work with the consent holder and contractors to rectify the situation so that similar issues do not arise again in the future. In significant or regular non-compliance situations the regulatory compliance team may take more formal action. This can include issuing an abatement notice on the consent holder that lists actions required to be undertaken within a specified timeframe, or requiring the consent holder to cease an activity. Failure to meet the conditions of abatement notices may result in escalated enforcement being considered. Other forms of enforcement action include the issuing of an infringement notice (fine), the issuing of an enforcement order (a Court-ordered document, more formal than an abatement notice) or the start of a prosecution. How are the public kept informed of human health risks during physical works? Health risks depend on the activity being carried out and the location where the activity is being carried out. A detailed understanding of the proposed physical works was documented and used to prepare health and safety plans and information for distribution to the public. The Consent Holder regularly discusses health and safety matters at Community Liaison Group (CLG) meetings and informs members of the public that own or occupy land directly adjoining the project site via letter box drops and meetings. Accurate and timely communication forms a big component of the project implementation phase. A communications plan has been prepared by the consent holder and approved by the CLG. This document outlines the various phases of the project and communication methods that the applicant will use during the project physical works. How do you measure dioxin in the Canal water during works so you know when there has been a breach of the consent conditions? Getting a sample analysed for dioxins can take up to 2-3 weeks. In order to provide real time data, turbidity, total suspended solids, and dioxin proxies will be determined in accordance with consent conditions. This will provide an understanding of dioxin levels in the canal water based on turbidity values. Data will be collected from turbidity meters mounted on buoys within the canal. The turbidity buoys can be programmed to record readings at set time intervals and then transfer that data to onshore data capture and management systems via telemetry. Compliance triggers can also be programmed in to ensure that the contractors and compliance monitoring staff are aware if turbidity levels are approaching a compliance limit. What has been done to ensure that the geobags aren’t vandalised? Fences and other security measures will be in place at the containment sites to ensure that the containment systems are not vandalised. When you open the geobags, will dioxin be released into the air? The only time that this is likely to occur is for sampling or bioremediation. If this activity occurs it will be for a short duration and measures will be in place to minimise dust generation and monitor air quality. As long as the mitigation measures are in place the consent holder expects that the very low air quality compliance limits can be met. What has happenned to the eels during the process? Will their carcases be able to be eaten by birds/vermin? The eels have been fished out of the canal. They were euthanized and frozen and fed into the geotubes thereby eliminating birds and other vermin feeding on the contaminated eel tissue. How do you deal with contaminated debris? Existing debris will be removed from the canal prior to dredging, cleaned off, and disposed of at containment sites. Any debris that flows down the canal should be captured by the sheet pile control structure on the western end of the project site. What is the discharge from the Keepa Road pipe near the containment site? The pipe is a monitored discharge from Containment Site 3 off Keepa Road. It is a consented and compliant discharge of clean water that comes from the geotube bags (for more information on dioxins bound to the sediment and not discharging from the geobags, please see the FAQs under ‘what to do with the sediment’). The turbidity of this water is continuously monitored on release to the Canal. The storyboards below were prepared for the 2015 trial and the current process has changed in several ways since that time (for example, the dredge is secured to a barge, not on the side of the Canal) but there is some useful detail and diagrams to explain the process. If you have any questions about the current processes, please contact the Project Team. Aerial view of the Kopeopeo Canal. Get notified by email when we update this project. Send us any feedback, images, videos, news or other content about this project. It has been a busy few months on the Kopeopeo Canal Remediation Project and this newsletter provides a short update on dredging progress to date, moving to the new containment site, recent community meetings and how to find out more. Following a pause in dredging over the December and January period, dredging is back underway on lower section of the Project area, down towards the wetlands. Work paused to allow plant and machinery to move to the second containment site off Keepa Road. This marks a significant milestone - more than half of the 5km length of the canal to be cleaned by the Project had now been completed. 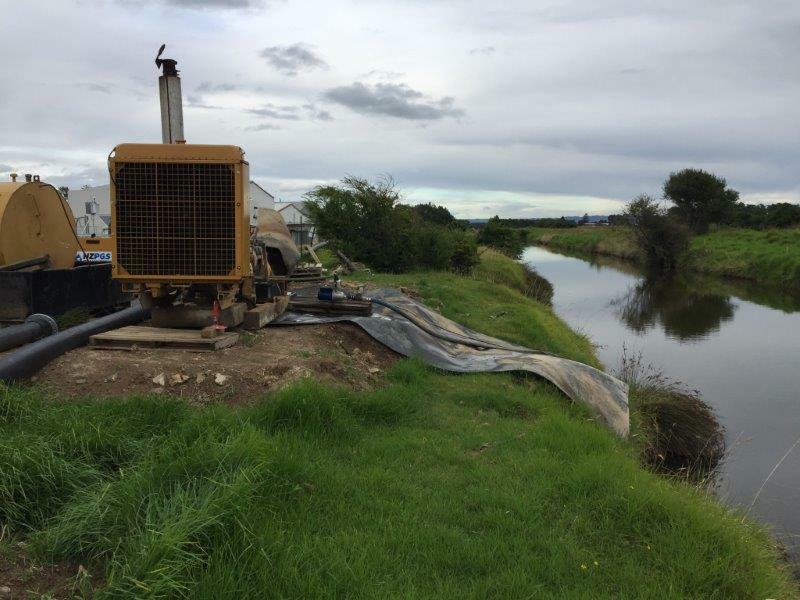 The contractor, EnviroWaste Services Limited, has started using an improved dredge head and a few tweaks have been needed at the start of the year as we get up to speed, but dredging in the Canal section from Whakatāne’s wastewater ponds towards Keepa Rd is now well underway. Dredging has been slower than we anticipated as our focus continues to be safe removal and transfer of the contaminated sediment into sealed geotube bags at the containment sites. We now expect dredging to continue until around the middle of the year. Following that, there will be considerable follow up work to cover the geotube bags at the containment sites and ongoing civil works (cover material, tree planting, adding inoculated material and reinstatement) to get bioremediation going. For that reason we expect that the Keepa Road containment site will continue to allow pedestrian-access only until early next year. We will continue to keep the community informed and up to date on progress. The February CLG meeting was a busy one and the meeting minutes are now available on the website. As usual, these minutes are considered draft until they are confirmed at the next Meeting. For those who missed the meeting, the presentations are also available on the website and there are some useful graphics and diagrams to show progress. There was some interesting discussion at the meeting about the dioxin levels in each of the geobags at Containment Site 1 and validation test results. A ‘Tech Talk’ is tentatively planned for at the next CLG on Tuesday 14 May to help better understand the differences between validation testing, sampling and chemical validation. We look forward to seeing a good turnout for this. 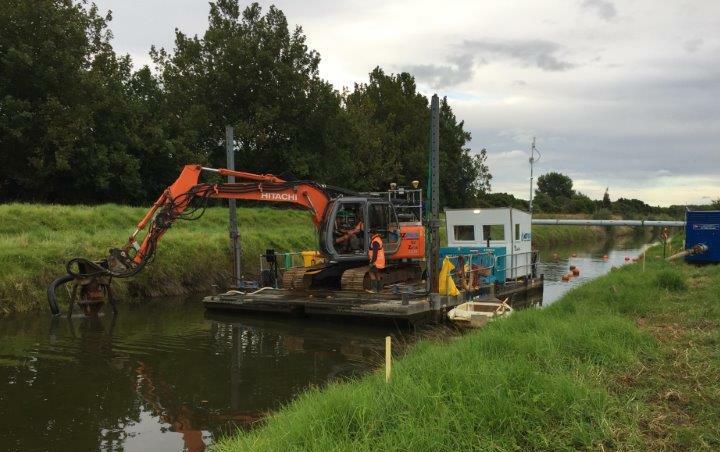 In February, dredging re-started and the sediment is now being transferred to Containment Site 3, located on the riverbank near Keepa Road. The Keepa Road carpark is a popular public-access spot, particularly for dog walkers and cyclists. With the additional truck movements and site activity in the area, we are asking that people are extra cautious around the Keepa Road bridge site entrance and keep a careful lookout for vehicles. 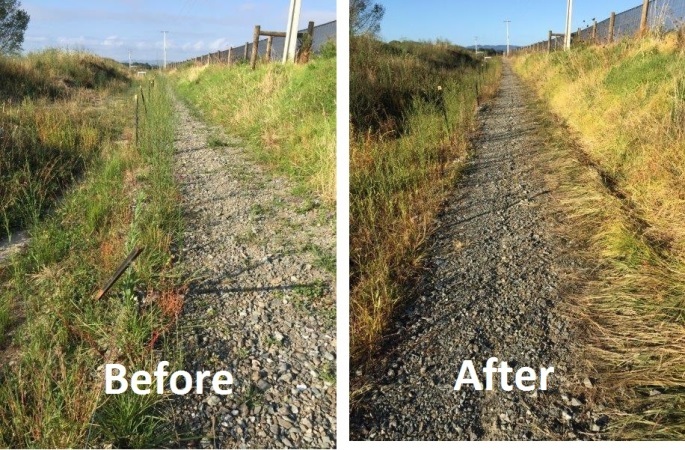 We have completed a tidy-up of the Pedestrian access alongside Containment Site 3 and it continues to be a well-used path. There has been some public discussion about pedestrian access alongside the Keepa Road Containment Site and at this stage pedestrian access only is likely to continue through until at least early next year. We understand that it is frustrating for some whitebaiters but appreciate the community support through this process. The end result of the short-term frustration will be a healthier (and fishable) Canal for future generations. The Project employs a cultural monitor to provide advice on cultural matters and to ensure that any cultural finds are managed in accordance with the Ngāti Awa protocol for dealing with koiwi or taonga. We follow a strict process for dealing with any finds in the sediment, although it is worth noting that most finds are old coins and animal bones. Our consultant archaeologist is informed and strict procedure followed. If you would like to know more about this interesting aspect of the Project, come along to the next CLG meeting and have a chat with our Cultural Monitor, Eula Toko. Given the proximity to a number of residences and businesses, we are keeping careful track of noise associated with the works including the boost pump on the Canal bank near Kope Canal Road which will operate for a relatively short time. We have also had a few of complaints about dust coming from Kope Canal Road opposite Gateway drive. The mobile dust monitor has been placed close to the boost pump and dust levels are being continuously monitored to ensure they stay below compliance requirements (to date they have been). Whakatāne District Council staff accessing the oxidation ponds and project contractors have been asked to keep speeds down on that road to reduce dust as much as possible. And finally, a recent compliance check means that Containment Site 3 is fully compliant and there were some useful suggestions on dealing with the oversize material. It has also been a busy year for the Chair of the Community Liaison Group, John Pullar. You may remember John was a TVNZ Good Sort last year. 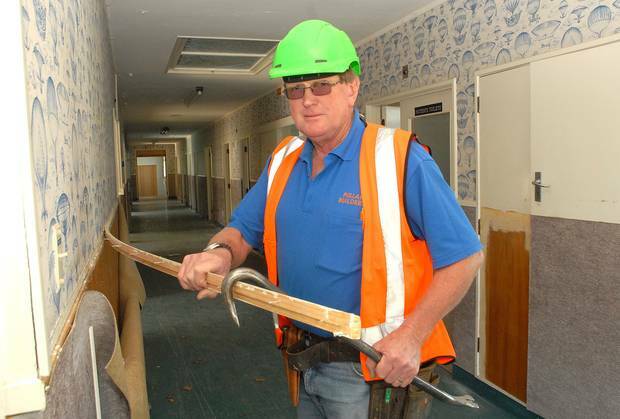 He also received a Kiwibank Local Hero medal for his outstanding contribution to our community. He was a finalist in the Herald’s People’s Choice awards for New Zealander of the Year and received the Queens Service Medal in the New Year’s Honours List. Well done John! We are very fortunate to have you as the Chair of our community group and we appreciate your hard work for the community. Congratulations. Dredging is progressing well with more than 260m dredged since February and the sediment is steadily filling four of the geotubes on containment site three. One hundred metres of that section has also been validated. There has been some discussion about the discharge from CS3 into the Kopeopeo Canal. The pipe can be seen from Keepa Rd and it has raised some questions for passers-by. We will be putting up some signs in the coming weeks letting people know that it is a monitored and compliant discharge of clean water that comes out of the geotube bags. The turbidity of this water is continuously monitored on release to the Canal. Pictured above: Mobile dust monitoring at Gateway industrial area. There has also been a lot of oversized material and we are working on improvements to manage it better including changes in the skip bins and processes. We have also had a number of complaints about the dust – primarily from the Kope Canal Road opposite Gateway drive. The mobile dust monitor has been placed close to the Boost pump and dust levels are being continuously monitored to ensure they stay below compliance requirements (to date they have been). We are aware of the issue, and have asked Whakatāne District Council staff accessing the oxidation ponds and our own contractors to keep speeds down on that road to reduce dust as much as possible. 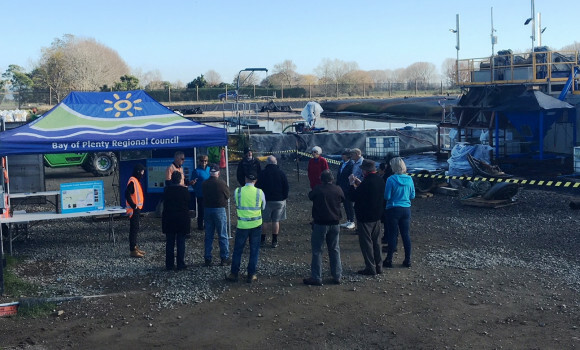 Another significant milestone has been achieved for the Kopeopeo Canal Remediation Project as dredging of the Canal resumes and water treatment works move to the second containment site at the Whakatāne River end of the Kopeopeo Canal. Deputy Project Manager, Ken Tarboton, said that moving to the new containment site off Keepa Road represented the progress made by the Project to date. More than half of the 5km length of the canal to be cleaned by the Project had now been completed. “Last week, dredging got underway again pumping the dredged sediments to the second site, CS3 [Containment Site 3]. The contractor, EnviroWaste Services Limited, has commissioned an improved dredge head, and is currently making fine adjustments during the next week while they ramp up to full speed. “It is a good time to look up and appreciate what has been achieved to date. It can be easy to get caught up in the day-to-day nuts and bolts of such a big project so the visibility of the move to the new site is a good reason to acknowledge the 2.8km of Canal that has had the dioxin-contaminated sediment removed and the Canal will be healthier and better for the next generation,” Mr Tarboton said. 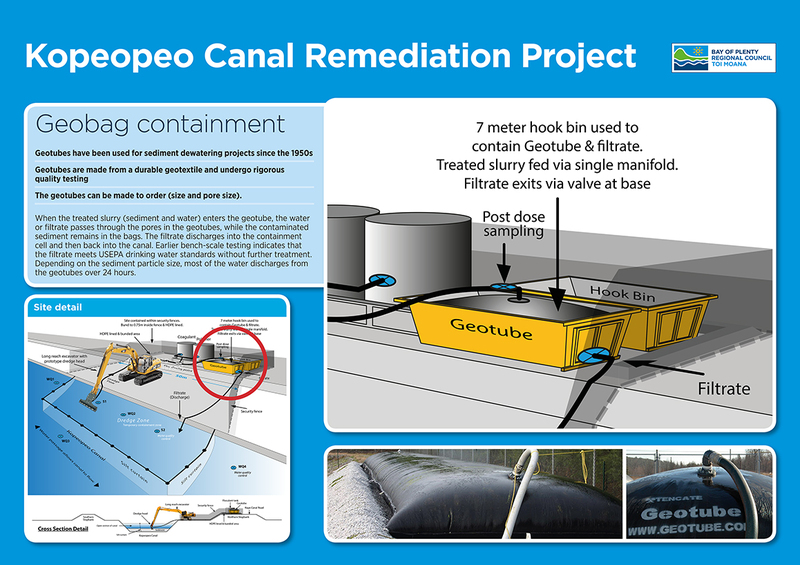 In stages, the Project will remove and safely store up to 40,000m3 of sediment from the Canal using the cutter-suction dredge and Geotube® containment methodology. 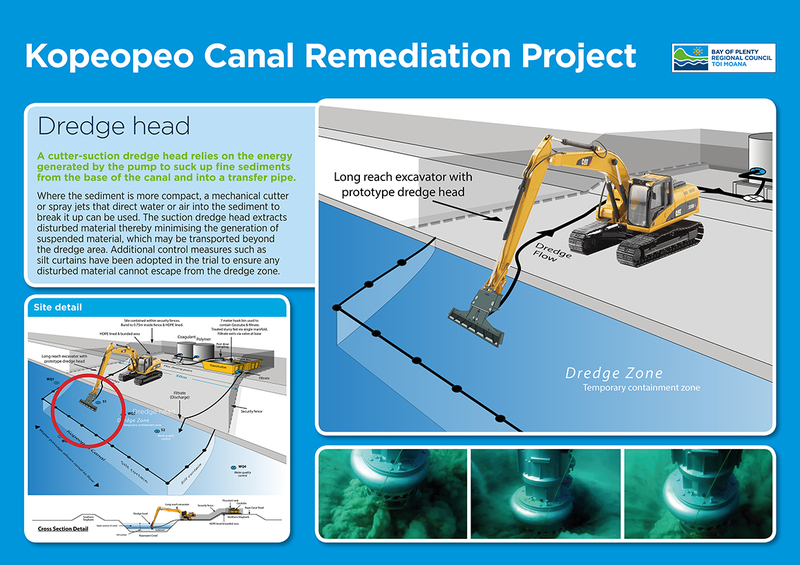 Following dredging the contained sediment will be treated using bioremediation. The Canal was contaminated between the 1950s and late 1980s as a result of stormwater discharges from a former sawmill, which treated timber using Pentachlorophenol (PCP). Pedestrian and bicycle-only access to the Whakatāne River stopbank will remain for the health and safety of the public throughout the duration of the Project. “This is a working operation dealing with contaminated material and we ask that people walking dogs or accessing the river to fish and so on stick to the marked access paths for their own safety,” Mr Tarboton said. Access through the site will remain restricted for the duration of the dredging phase of the project and during some of the site works and bioremediation towards the end of the year. 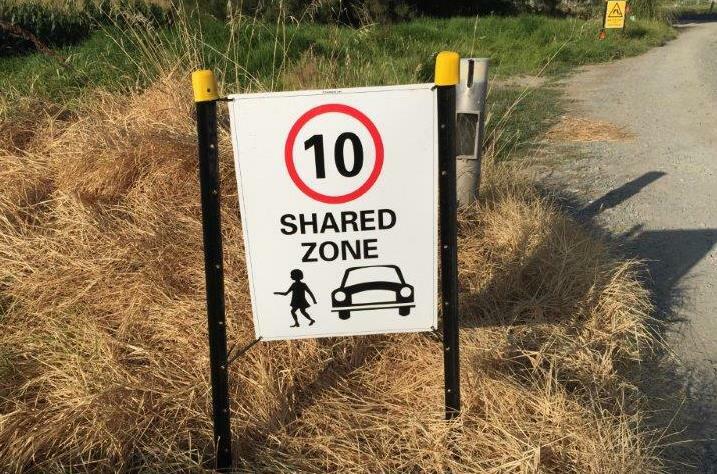 Contractors have been asked to be particularly aware of pedestrians and cyclists at the site entrance off Keepa Rd, and the public is asked to be cautious around the Keepa Road bridge as there is increased contractor traffic to the site. The community continues to be involved in the Project through the Community Liaison Group and activities such as last year’s well-attended public open day. Businesses near the new work site recently received a letter providing an update and letting them know site operating hours and contact details in case of any issues. An independent monitor also keeps a close watch over the Project, reporting back to the community with regular updates and feedback. “Dredging has been slower than anticipated as the focus has continued to be safe removal and transfer of the contaminated material to the containment sites. We expect dredging to continue until around the middle of the year. If people have any questions for the team they are welcome to get in touch, or come along to the next CLG [Community Liaison Group] meeting on Tuesday 26 February which is open to the public,” Mr Tarboton said. Thanks to everyone who came out to the containment site on the corner of Kope Drain Road and SH30 on Saturday. We had an excellent turnout with more than 60 people being shown around the site. Thanks to everyone who came out to the containment site on the corner of Kope Drain Road and SH30 on Saturday. We had an excellent turnout with more than 60 people being shown around the site. I was thrilled with the engagement and in-depth questions asked of the project manager and site manager. It was genuinely difficult to interrupt the conversations to start the next tour group and that was how it should be. Thanks everyone! Watch a clip of John Pullar, Chairperson of the Kopeopeo Canal Community Liaison Group, tackle getting a community back on track after devastating floods. 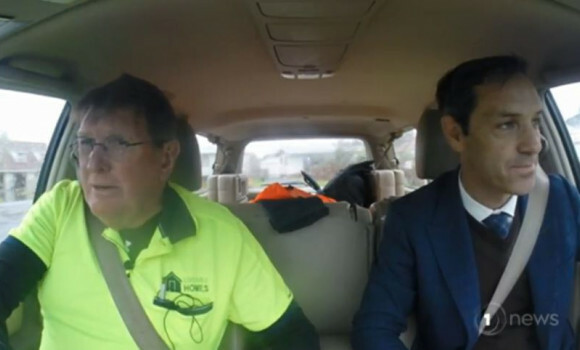 While it is not directly Kopeopeo related, we were still chuffed to see our Community Liaison Group (CLG) Chairperson, John Pullar, on the news as our local 'Good Sort' for his work in the post-April flood re-build. Awesome work John! Check out the TVNZ video clip. We're very excited to announce that we will be holding the community open day for the Kopeopeo Canal Remediation Project on Saturday 16 June 2018. We're very excited to announce that we will be holding the community open day for the Kopeopeo Canal Remediation Project on Saturday 16 June. We look forward to seeing you at 1 Kope Drain Road where brief tours will be given from 10am until 12.30pm. For more information contact Kopeopeo@boprc.govt.nzor call 0800 884 880. The Community Liaison Group meeting held on Tuesday 29 May 2018 was an eventful one so thank you to all those who came along and made it so memorable. Those present were enlightened by Karam de Lacey of Control Tech about the advanced technology being used in the field to monitor turbidity and water levels on the project for routine monitoring and flood situations. 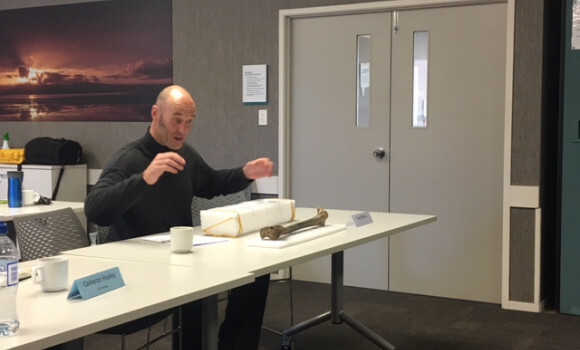 And to top it all off attendees were regaled with the chance to view and hold a moa bone discovered in Coastlands by Guy Barlass. Now that's something you don't see every day. We are pleased to confirm that Karam de Lacey of Control Tech will present a Tech Talk at the next CLG meeting on 29 May 2018. We are pleased to confirm that Karam de Lacey of Control Tech will present a Tech Talk at the next CLG meeting on 29 May 2018. Karam will talk through the various environmental monitoring tools used on the Kopeopeo Canal Remediation Project to give the Project Team real-time data to guide their decision-making on flood management. Members of the community are warmly invited to attend the meeting to find out about this fascinating aspect of the Project. For seating and catering purposes, please email kopeopeo@boprc.govt.nz to register your interest in attending. The agenda will be published on the CLG page one week prior to the meeting. The minutes from the last meeting held in late-April are now available on this page. There are no events scheduled for this project. Follow what we're working on in the Bay of Plenty. We’re developing an action plan to guide Regional Council’s climate change response work.